How one of America's most successful televangelists was forced into a humiliating public confession from the pulpit, after he was caught with a prostitute. 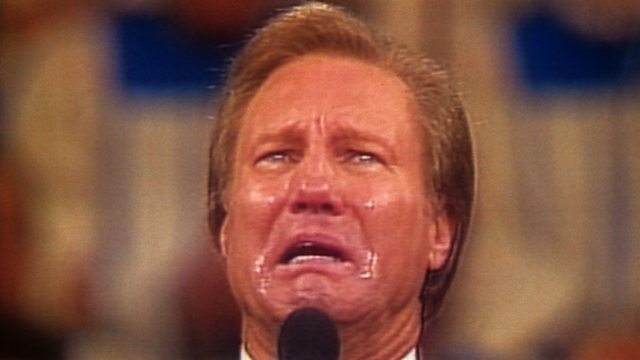 In February 1988 Jimmy Swaggart, one of America's most successful televangelists, was forced to make a humiliating public confession from the pulpit. He had been caught in the company of a New Orleans prostitute. Swaggart's tough no-nonsense style of preaching had won him a huge global following. He had also been fiercely critical of other evangelical preachers who had become mired in sexual scandals. Mike Lanchin hears from the Baton Rouge news reporter Edward Pratt, who followed Swaggart's rapid rise to fame and sudden fall.